Let's jump in, let's talk about why sales playbooks are so important. 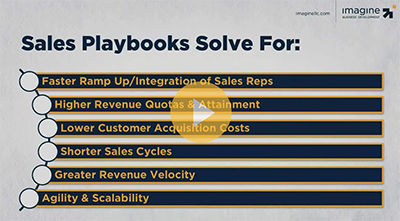 What is it that we need sales playbooks for, or as I like to talk about it, what is it that sales playbooks solve for us? One of the first things they do is, they really help you ramp up salespeople faster, or if you're involved in different types of acquisitions or things like that, to integrate new sales reps into your organization faster. A caveat of that, or the corollary of that is, they also make it easier to hire salespeople. They broaden the talent pool for those that can be successful, so they actually decrease the mis-hiring. The second thing sales playbooks solve for are higher revenue quotas and revenue attainment. Companies with good, strong, strategic playbooks have higher attainments of quota, and quotas are at higher rates. They see lower customer acquisition costs, they experience shorter sales cycles, greater revenue velocity. What's interesting, and the reason it's interesting is because oftentimes when we talk about things like playbooks, which quickly connect to process, people oftentimes think of process as making them more rigid, or making the organization more rigid. One of the critical components for sales is the ability to be agile, the ability to adjust quickly. Playbooks actually enable you to be more agile. They get everybody on the same page while freeing them to perform in their style, within their personality, and to leverage their unique abilities, while staying connected to the customer and keeping everybody aligned, so sales playbooks also drive agility and scalability. Now, don't get me wrong. Doing a playbook doesn't actually do anything. I know you're probably pretty excited. "Hey, I took an hour out of my day today to learn about the seven components of effective playbooks and the guy who's teaching me just said, “having a playbook doesn't do anything.” That's true. You have to use the playbook and unfortunately, most playbooks that are developed don't drive these results. Let's look at why sales playbooks fail. Why do companies put the time in to developing the playbook and ultimately don't see the results that they were looking for. Well, the first reason they fail is, too often playbooks are not built for use. They're built to create the feeling of certainty, or to satisfy a board or a boss, or some reason where they get developed, too often they get printed out. They get put in a notebook, then get put in a drawer if you're lucky and they never see the light of day. You've got to be thinking about your playbook from the perspective of designing it for utilization. A playbook is designed to be used. It needs to be applicable, it needs to be helpful, it needs to leverage the efforts of your sales team. The next reason is that the underlying process or design of the playbook is either built on a process that's too rigid and doesn't stand the test of the market or it's too vague. It's a series of philosophies and ideas or it's just a random set of workflows that get used by certain people at random times. One of the great mantras any sales organization can chant is "solve for the customer." Always solve for the customer. The third reason that playbooks fail is too often they're focused internally. They're designed for efficiency. They make us internally focused and they're not aligned with the customer. Your customer, the person you're trying to attract, needs to be at the center of your playbook. Oftentimes assumptions go into developing your playbook. Actually, it's not oftentimes, it's always. You're going to build assumptions and if you're not using the playbook regularly, and you're not iterating the playbook, those false assumptions cause the playbook to be irrelevant. You've always got to be testing your assumptions. By the way, there are many times that the aspects of the playbook were right on, but the world changes and they don't keep up with it. That leads to the last reason, is they're not built for iteration. They're not designed to be utilized, refreshed, updated. Playbooks should always be working and you should always be working on your playbook. I'll make this clear, we are not fans of printed out playbooks. Printed out playbooks are the fastest way to get them not to be used. It creates all kinds of version control issues. They're very difficult to iterate. There becomes a bureaucracy in managing playbooks. Keep it focused, keep it agile, keep it interactive.